As people who ‘know’ me on Facebook or in person will know, I have spent the whole summer (since May) travelling and it transpired that I could not update this blog with my ipad, which was all I had with me. I visited three of the best wineries in Bulgaria, judged at the Balkans International Wine Challenge in Sofia, then lectured and tasted in Hong Kong, and toured mainland China, including visiting Ningxia, China’s best wine production area. I’ve tasted hundreds of wines in Transylvania as part of the Wine Book of Romania project, about which we are all very excited. So, I have lots and lots of notes destined to become blog entries. 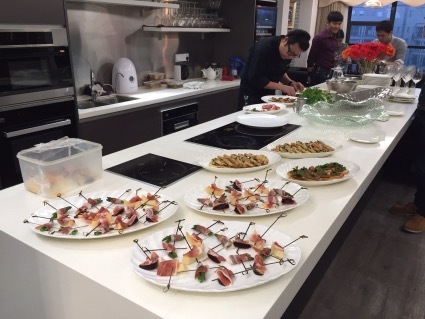 I hope to revitalise the Riviera Wine Academy now that I am back, although I have managed to fit in a few yacht tastings in between the above. What to write for this first blog-in-ages? Well, yesterday I had to collect a parcel that would not fit into my mailbox, and had instead been left at a point relais in the village. After deciphering what this was (the delivery person’s handwriting was decidedly medical) I trundled along, to discover that this place Domaine d’Olivier, as well as being a drop off point for parcels, is a local delicatessen. Collecting parcels from places always seems to me – entirely irrationally - to engender guilt about visiting the place with no intention to purchase what they sell. Previously for me this has been a motorcycle accessory shop and a place that makes tampons or stationery stamps (surely a very niche business?). They were easy not to buy things in. But a delicatessen. Which sells wine. That’s a different matter now isn’t it? Over the course of my visit to China (including a weekend away in the magical Taiwan) I had cause to eat a lot of weird things. Sometimes my choice, and occasionally out of a sense of duty. Goose feet in mustard. Jellyfish (any number of ways). Iron egg (don’t ask). Stinky Tofu. Fried pig-blood on-a-stick (rather nice) and of course, silk worm cocoons (actually delicious, although the ‘liquid’ centre is a little off-putting at first). When I got home I made a dash for steak tartare, but subsequently my diet has been rather mundane. So, faced with a jar of Starling Terrine, what could I do? 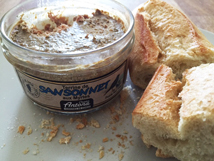 Some of these terrines, pâtés and rillettes that the French put in jars can be all a bit dog-food-esque, at least visually (I have never actually eaten dog food. Well, that biscuit once, but I was young! And drunk!). But this Corsican confection is actually rather delicious, although I cannot say it exuded any particular Starlingy-ness. It was rather more liver-y, and I suspect that the ingredients might suggest the inclusion of some other animal’s liver as a base. Either that or these particular starlings were drunken sots with particularly engorged organs. I find picking the meat off a chicken to be rarely especially worth the effort, so I cannot imagine quite how much fuss is involved in stripping bare a starling skeleton (perhaps they don’t – I’m not sure I want to think about it!) Anyway, a good excuse to enjoy some very good bread – which is something the French really do the best on earth (although it stales within a matter of hours). Obviously, even though the flat is stuffed with bottles, I couldn’t resist trying one of the wines that Domaine d’Olivier offers – an esoteric collection including some greats and some local hard-to-find examples. I like Syrah, and I think there is great potential for it in the higher altitude vineyards of the Riviera. 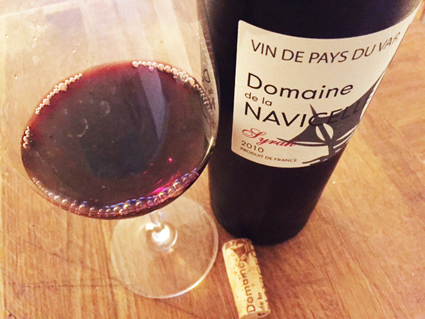 Also somehow I miss the expression Vin de Pays, which was outlawed in 2011 to be replaced by the somewhat more utilitarian and less romantic sounding Indication Géographique Protégée. I doubt that very many such VdP wines will remain drinkable for much longer, given that the youngest of them are from 2011. But this is one that will. Full of crushed black fruit, peppery spice and liquorice. If there’s oak it’s way in the background, and the wine is everything it should be; fruity, spicy and delicious. I chilled it slightly, and damning-with-faint-praise though it might be, I can readily attest to it being a perfect match with starling. This was the parcel I collected, and I was very excited about it. Max Richter’s work is contemporary classical, but with no fear and an embrace of modernity; keyboards, tape loops, electronic and so on. His album Memoryhouse is one of my all time favourites (mind you, it does feature the sublime voice of Sarah Leonard), and this is his latest work. Well, a part of it. Richter has spent a long time composing an eight-hour work (the longest continual piece of classical music to be recorded, or somesuch). It is a true lullaby in the sense that it is designed to send you to sleep and accompany that, which is why it lasts eight hours. He consulted with neuroscientist David Eagleman to learn about how the brain functions during sleep. The whole work was broadcast on the evening of the album’s release on September 3rd, and people all over the world took part (the performance started when you wanted) and left their thoughts and comments. I did too, although I found myself awake and listening to quite a lot of it (maybe I set it too loud), at least in part thinking that perhaps there might be a Psycho-Shower-Scene-type interlude at 4am as some kind of mad experiment (Richter is British, but born in Germany after all!) 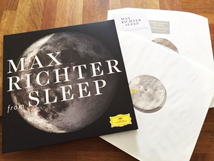 Although you can buy the whole eight hour work (on itunes), the record release is one hour, and, according to Richter selected to be listened to rather than slept through. It’s nevertheless very gentle, contemplative music. Unlike his previous work in that respect, but with his characteristic recurring melodies and rhythms, just all slowed down. I suspect this will become a much-listened to record as it is supremely relaxing. You can enjoy a taste of Sleep here. It is also very refreshing to find that Deutsche Grammophon have now started releasing vinyl records once again! You listen to music played analogue, while you only hear what has been – of necessity – compressed in digital forms. Well, I think anyway. So, welcome back to the blog – expect some Bulgarian, Chinese and Romanian entries very soon!